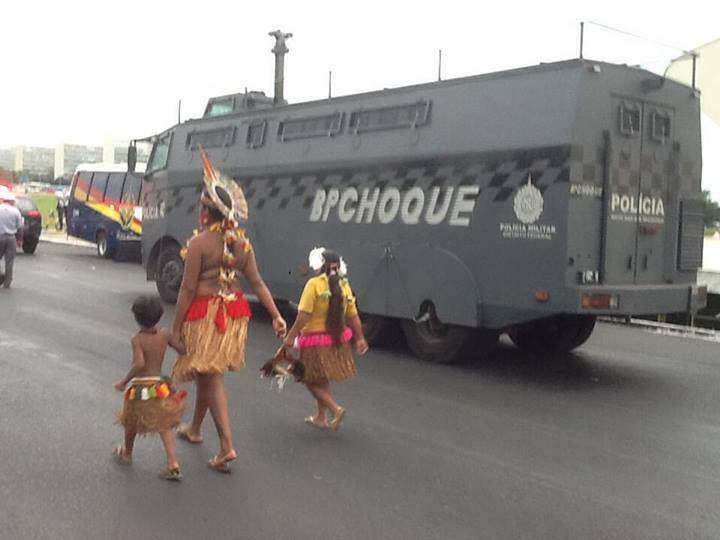 Nearly 1,500 Indigenous Peoples from across Brazil on Wednesday occupied a central road in the federal capital Brasília known as the Esplanade of Ministries, paralyzing traffic in both directions. 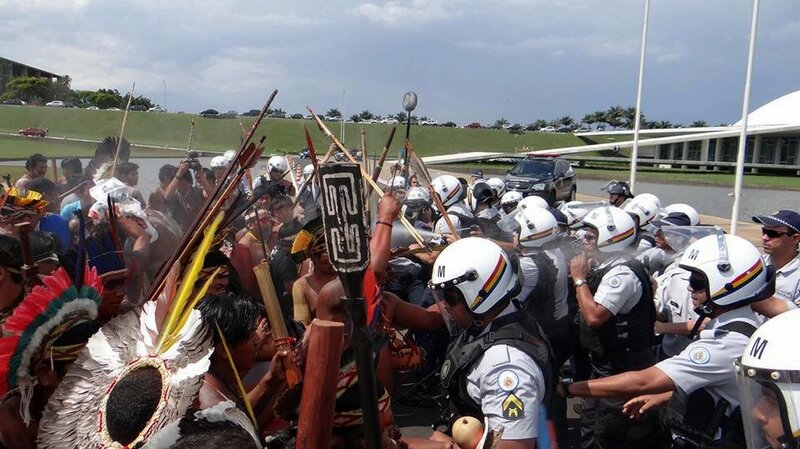 A part of the National Indigenous Mobilization convened by the Articulation of Indigenous Peoples of Brazil (APIB), the protesters are trying to stop a legislative assault that threatens to severely undermine or extinguish Indigenous rights in the country. Proposed Amendments to the Constitution (PECs) numbers 038/99, 215/00 and 237/13, Bill 1610/96, the bill for Complementary Law (PLP) 227/12, and the Portarias (ministerial orders) 419/11 and 7957/13. PL 1610, allows mining in Indigenous lands. 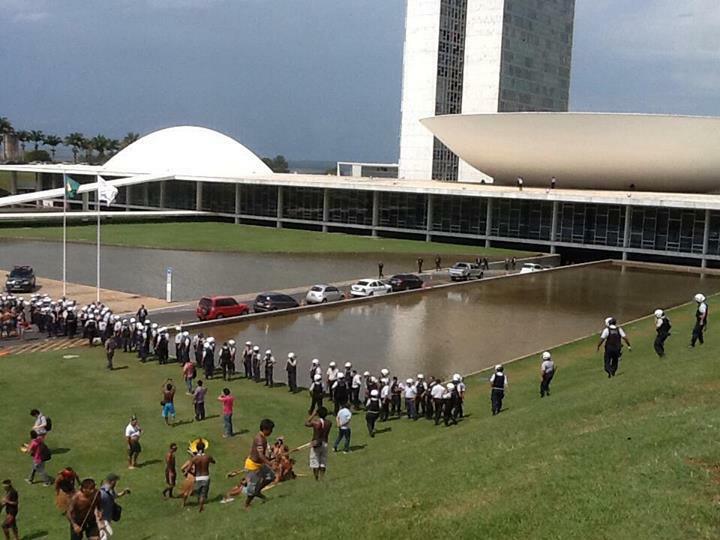 Prior to occupying the Esplanade of Ministries, the diverse group of protesters in Brasília, who represented more than one hundred ethnicities, attempted to enter the National Congress. 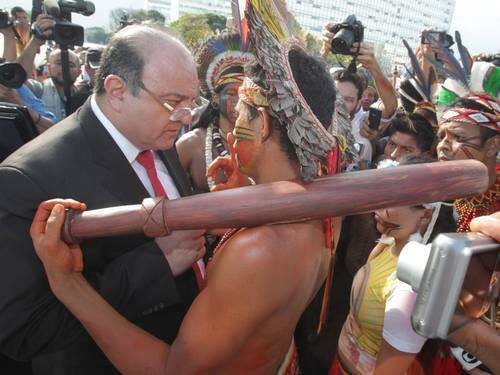 The Indigenous Peoples were met with pepper spray. 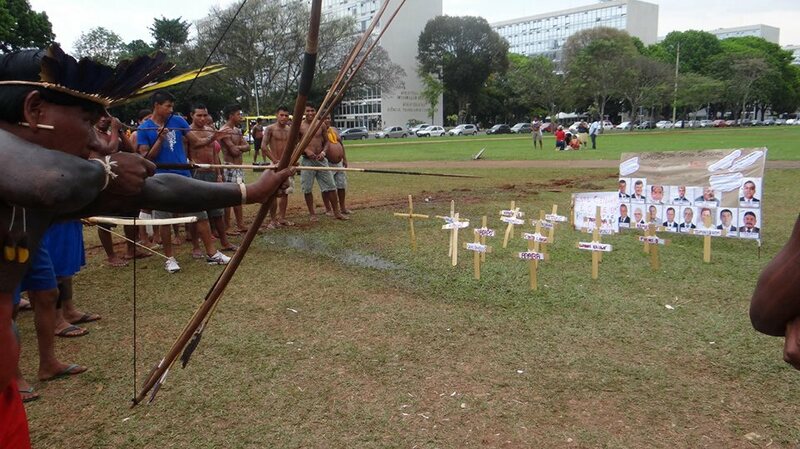 During the confrontation, APIB reported that one Tupiniquim participant was wounded with a deep cut to the arm and was sent to the University of Brasília Hospital (HUB) for medical attention. Rather than take the entire group of protesters on, government officials went on to request a meeting with a small committee of representatives. There was no consensus among the leaders, says the APIB. Many declined the offer, “[Insisting] that representatives of the government should come out of Congress and talk to all the Indigenous Peoples present.” However, a committee of 31 Indigenous leaders decided to meet with the acting President of the House, Andrew Vargas (PT-PR) to discuss PEC 215 and PLP 227. Later in the day, the Indigenous demonstrators returned to their camp where they held an assembly with Congressman Lincoln Portela. During the assembly, the Indigenous Peoples agreed to meet with a congressional group on Oct. 3 for further discussion.